A surprisingly weak third-quarter earnings report has investors worried about falling profits over the holiday shopping season. What: Department store Dillard's (NYSE:DDS) saw its stock fall 16% during the month of November, according to S&P Capital IQ data. The drop added to a rough year for shareholders: Dillard's is now down about 50% from the all-time high it set in April. It is 42% lower, year to date. So what: The retailer posted earnings results on Nov. 16 that, while just slightly below Wall Street expectations, pointed to a difficult holiday quarter ahead. Dillard's third-quarter comparable-store sales sunk by 4% as earnings fell to $1.19 per share from $1.30 the prior year. "We are disappointed with our third quarter sales performance and in the resulting decline in profit," CEO William Dillard said in a press release. Sure, Dillard's is just one of several department chains that are hurting as consumer spending migrates online. Macy's (NYSE:M), for example, last month posted a similar 4% comps decline, citing weakness in the same categories, apparel and accessories, that Dillard's did. For its part, Macy's management promised an "overdrive" focus "in response to changing customer shopping preferences." 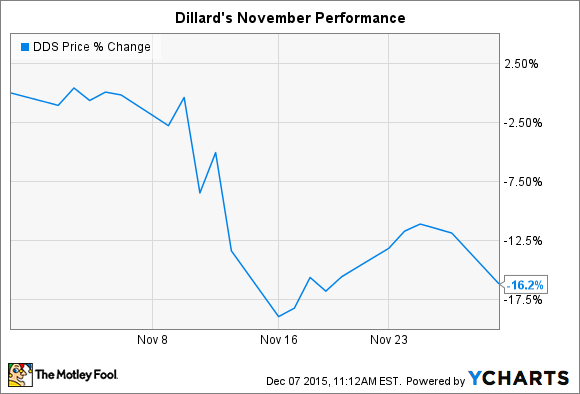 Dillard's executive team instead chose to highlight its stock repurchasing focus. The company spent $175 million buying back shares last quarter. Yet even if competitors are shrinking, too, it is Dillard's long-term profit potential that will determine whether the stock buys prove to be a good investment. The latest trends don't look good on that score: Net income sank 8% through the first three quarters of the year, to $185 million. Now what: The recent weak sales trends suggest that the fourth quarter could be substantially worse than the third. In fact, consensus estimates call for revenue to shrink by 3%. But profit is projected to take an even bigger hit, sinking 16% to $2.66 per share. Dillard's logged a 6% increase in inventory last month, even as the sales base shrunk. And those two trends suggest that gross margin might fall substantially over the holiday shopping season as the company is pressured to use price cuts to clear out its seasonal merchandise.